What Is Soil pH and What Does It Mean to the Gardener? What Does Soil pH Mean to the Gardener? A lot of emphasis is put on the pH of garden soil. Soil pH is a measurement of the alkalinity or acidity of soil. Soil pH is measured on a scale of 1-14, with 7 as the neutral mark. Anything below 7 is considered acidic, or sour, soil and anything above 7 considered alkaline or sweet, soil. Technically, pH is a gauge of the hydrogen-ion concentration (potential Hydrogen) in a substance. For the gardener's needs, it is enough to know whether your soil is alkaline or acidic because certain nutrients can only be accessed by plants when the soil pH falls into an acceptable range and no amount of fertilizer is going to improve their health until the pH has n adjusted. Most plants prefer a somewhat neutral pH, anything from 6.2 to 7.0. However there are many plants that are more specific in their pH needs, such as blueberries and azaleas, which like a very acidic soil, and lilacs and clematis, that prefer a more alkaline soil. There are even some, like hydrangeas, that change flower color depending on the soil's pH. Generally speaking, if your plants are growing healthy, with no signs of problems, your soil pH is probably in an acceptable range. However if your plants are looking stressed, discolored, or not growing vigorously, one of the first things you should do is test your pH. How to Know What Your Soil pH Is? 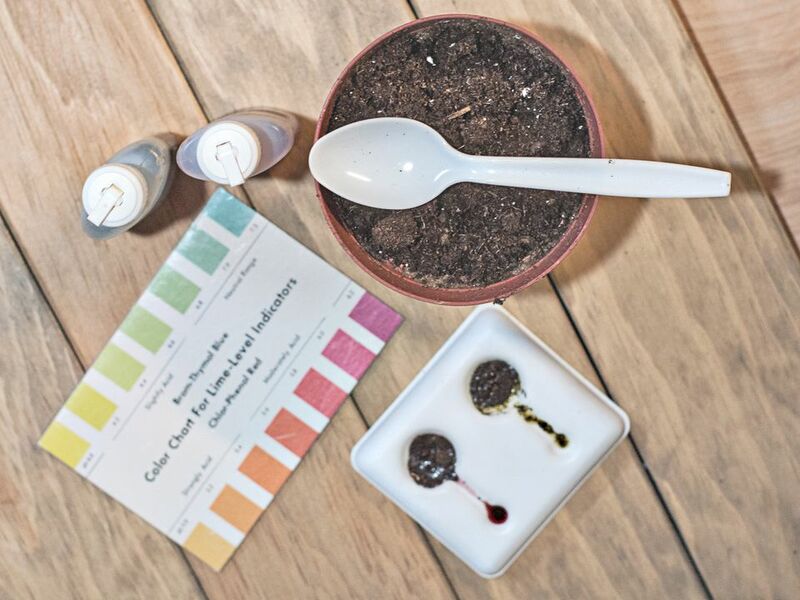 You have a few options, when it comes to testing your soil's pH. There are many do-it-yourself testing kits available in local garden centers. Most do a good job of at least telling you which end of the scale your soil is at and that may be all you need for making adjustments. For a more accurate measure, you can send a soil sample to a lab or bring it into your local Cooperative Extension office. They will charge a small fee, but you will have a more precise idea of where yr soil stands. If you simply want to know if you soil leans acidic or alkaline, here's a quick soil pH test you can do at home. It will only give you a ballpark reading, but it's a good place to start. It takes time to change the pH of soil, often months, and it will need to be an ongoing process. Left alone, soil will eventually revert back to its natural pH. However, you won't have to adjust all your soil, unless it is extremely acidic or alkaline. You can adjust just the areas where you are growing plants that need a different pH. Basically the pH of acidic soil is raised by adding lime. The pH of alkaline soil is lowered by adding some form of sulfur. How much to add depends on your current soil pH, the texture of your soil (clay, sand, humus) and what you will be growing. Your soil test kit or the report you get from the lab or extension should tell you what you need to do. And here's a quick way to test your soil's texture. Once you get your soil pH into an acceptable range, you will need to reapply either lime or sulfur on a regular basis, to keep it there. This is best done in the fall or off season, so that the amendment has time to work its way into the soil slowly, without harming plant roots. It's also a good idea to re-test your soil about every 3 years, to see if adjustments need to be made. Of course, your plants will have the final say. If they are going well, it's hard to argue for changes.